Sorting developers by their location is a mistake, says the former CEO of Capcom's Clover Studio. Platinum Games' Atsushi Inaba, who has previously worked on the Phoenix Wright and Viewtiful Joe series, has challenged the idea that Japanese developers are trailing behind their Western counterparts. 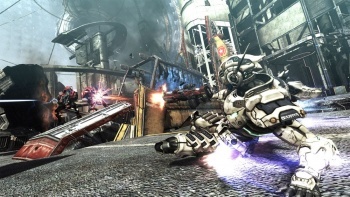 Inaba, who served as producer for Vanquish, said that it wasn't particularly useful to separate developers into East and West. He thought that a better division was good developers and bad developers. He felt that it didn't matter where a studio was based, as the teams that had great ideas and talent would succeed, and those that didn't would fail. He made it clear though, that he wasn't saying that Platinum was by any means perfect. One of the chief proponents of the idea that Japanese developers were lagging behind the West was another Capcom alumni, Keiji Inafune. Inafune famously said that Japan made "awful games" and that Western developers were five years ahead. Inaba disagreed with the Inafune's assessment however, saying that all that was happening was that some publishers weren't doing so well at the moment, and it didn't represent any sort of widespread collapse.